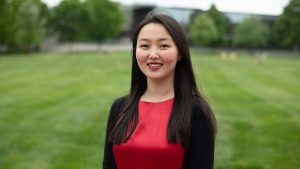 Rebecca Wai ’18 discusses her research on China’s use of energy projects for political gain, which she presented at the National Conference on Undergraduate Research. Read a transcript of Wai’s description of her research. 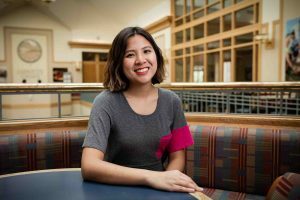 Maya Stine ’18 discusses her research on how female birds recognize foreign eggs, which she presented at the National Conference on Undergraduate Research. Read a transcript of Stine’s description of her research. 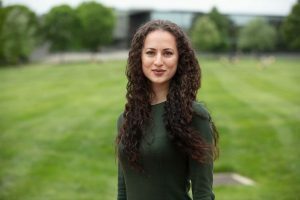 Iuliia Vasileva ’18, a double major in economics and international affairs, discusses her research on the economic benefits of foreign direct investment. Read a transcript of Vasileva’s description of her research. Why Do African Americans Have Higher Rates of Lung Cancer? 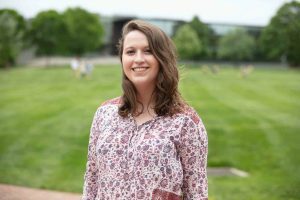 Amy Boles ’18, a biology major, discusses her research on the need for precision in cancer medicines. Read a transcript of Boles’ description of her research. Does Nutrition Affect Bird Brains? 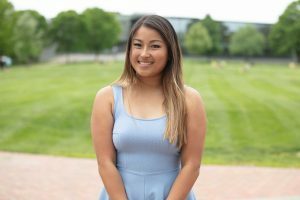 Khulganaa Buyannemekh ’18, a double major in neuroscience and German, discusses her study on whether adding stress to zebra finches in childhood causes them to develop smaller brains. Read a transcript of Buyannemekh’s description of her research.